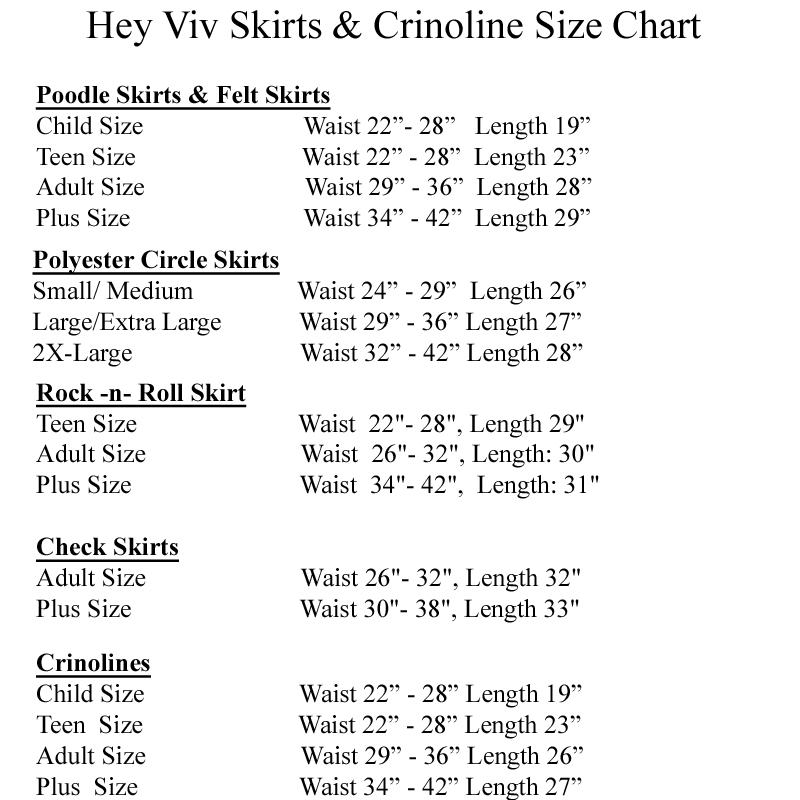 Sizes for Costume Skirts and Crinolines: All costume skirts and crinolines have elastic waists to fit a range of sizes. The measurements can be found in each listing. The elastic waist can stretch an inch or two beyond what's in the listing. Be sure to check the stated length. Poodle and circle skirts should fall below your knee. Crinolines are made of net which tend to 'spring' up. We measure the length with the netting pulled out full length. 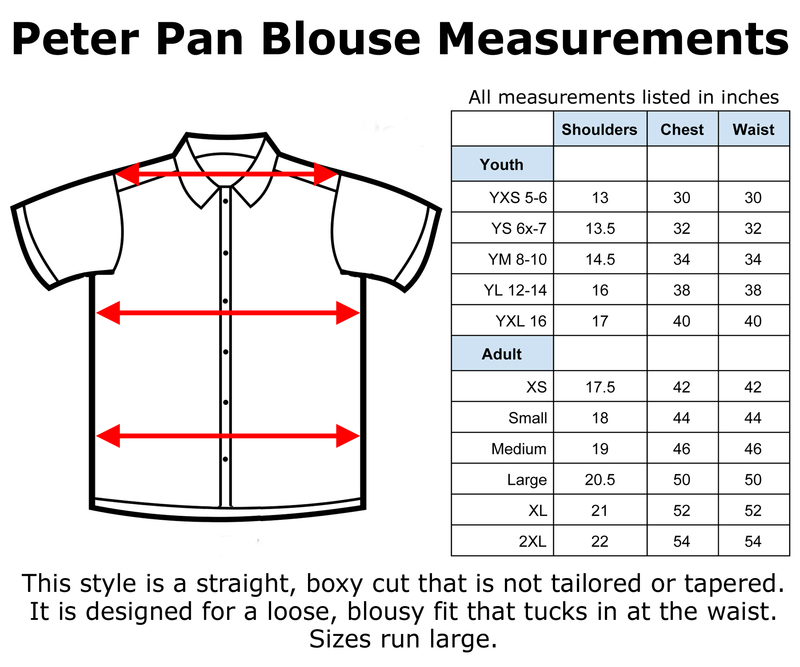 Sizes for Peter Pan Blouses: The Peter Pan blouses are standard sizes. They are a boxy cut (not tapered) and tend to run large. If in doubt, buy one size down. The puff tops are generous in cut and size and work well for anyone who needs a large or xlarge size. 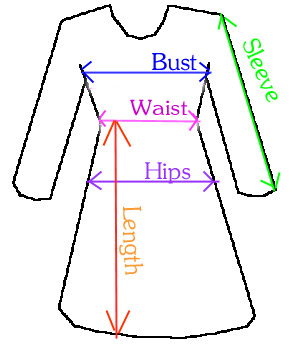 •Bust: we measure from side seam to side seam at the bust, just below the arm seam then double it. For example if it's 18" across from seam to seam we list it as a 36" bust. •Waist: we measure side seam to side seam at the waist and double it. •Hips: we measure side seam to side seam a few inches below the waist where the skirt flares out and double it. •Length: we measure from the waist to the bottom of the skirt. •Sleeve: we measure from the shoulder seam to the bottom edge of the sleeve. How can you figure out what your measurements are? Try taking a dress or top that you know fits and measure the bust and waist. Use a tape measure or string and measure yourself using the sizing diagram as a guide. This will give you a starting point to compare. Questions ? 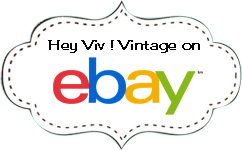 Call us at 866-543-9848, email customerservice@heyviv.com , click on the Chat box.